There is nothing quite like sitting down to a steaming pot of soup or stew on a chilly winter’s day for instilling in us a sense of wellbeing and contentment. We might find ourselves letting out a little sigh of anticipation for the warmth and satisfaction that we know this dish will bring. In ‘Foods for Health & Healing’ Yogi Bhajan talks about the benefit of eating both nutritious and sustaining foods for optimal health and wellbeing. Nutritious foods supply us with all the macronutrients (carbohydrates, protein and fat) and the micronutrients (vitamins and minerals) that we need for energy and strength. Sustaining foods go a step further as the nutritional value is added together with the texture, taste, aroma and the way it is prepared – the combination being somehow more potent than the sum of the ingredients. This is the magic of one-pot dinners! According to ancient Indian theory, all matter is divided into three categories: sattva, rajas and tamas. The foods that work well in one-pot dinners fall into the sattvic and rajasic categories. Root vegetables, herbs and spices and the trinity of onions, garlic and ginger are rajasic and give us the energy to accomplish what we need to do in the world. 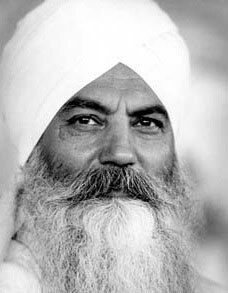 Yogi Bhajan suggested that ‘earth foods’ i.e. those that grow below the ground should be eaten more frequently in colder climates and during the winter months due to their high energy releasing carbohydrate content. Sattvic foods include ‘sun foods’ – those grown on trees or vines and ‘ground foods’ such as beans, rice and green vegetables and represent the meditative, etheric quality. A fantastic way to begin cooking any one-pot dinner is with the trinity roots of onion, garlic and ginger. The allium family of onions and garlic are of great benefit to human health containing antimicrobial, anti-viral and antifungal properties as well as being anti-inflammatory, lowering cholesterol and being protective against a variety of cancers. Ginger is a digestive stimulant, anti-inflammatory and is well known for it’s strengthening and ‘warming’ properties as it increases metabolism and energy. The reputation of turmeric as a super food and medicine is growing fast. Its main active ingredient curcumin is a potent anti-oxidant and anti-inflammatory. Curcumin is fat soluble so requires the presence of fat in the meal. Amazingly adding black pepper to turmeric enhances its absorption by up to 2000%! Adding beans and lentils to soups, stews, casseroles and curries provides an excellent source of fibre, protein and nutrients helping to regulate blood glucose levels, prevent constipation and support cardiovascular health. It is worth noting that most plant proteins are incomplete but some become complete when combined – for instance hummus (legume + seed) and lentils with rice (legume + cereal). A great yogic favourite is Mung beans & Rice with vegetables – perfect winter food and a complete source of protein! Add brassicas to your soups and stir-fries (e.g. broccoli, cabbage and cauliflower). This group is high in vitamins, minerals and antioxidants (protect our DNA from damage caused by oxidants and carcinogens) and are detoxifying and anti-inflammatory. One –pot cooking helps to keep in as much of the nutritional value of water-soluble vitamins as possible. So steam sauté (sautéing food in oil for a short amount of time and then adding water and covering food until cooked) and make soups and stews to maximise intake of these essential nutrients. Dark leafy greens are a powerhouse of nutrients and are best added to a dish towards the end of cooking. A handful of spinach wilted into a chickpea stew last minute is one of my favourites and brings colour, texture and interest along with the nutrients. In order to increase the absorption of the fat soluble antioxidant carotenoids in red, orange and yellow veg that frequently make an appearance in one-pot dinners, drizzle a little coconut oil, butter or olive oil on your soup or stew at the end of cooking. So get creative and hunker down with a one-pot dinner to bring wholesome healing, joy to the taste buds, satisfaction to the stomach and an overall feeling of warmth and wellbeing on these long chilly winter nights. Thank you Kate! – so glad you found it useful.